2014 Azalea Half Marathon Finishers Medal. Congratulations to all of the Azalea Run Raffle Winners!! If you won a raffle and haven't picked up your prize, you can stop by Garden Adventures in Nixa or they will be available at packet pick up and on race day. April Raffle Winner - Taylor Daugherty of Chadwick, MO won the Azalea Rocks Glasses. Don't miss your chance to be in the SEPTEMBER RAFFLE and win an Azalea Run Fleece Blanket!! Remember, the more people you refer to the Azalea Run, the more chances you have to win!! Rocco's Pizza in Nixa is excited to be the official Team Award Sponsor for the 2nd Year! The largest team award will be figured on the total number of team participants from all 3 events. Last year's Largest Team Award went to the Running Chatters with over 30 team members. Who's it going to be this year?? We were joined by over 500 runners & walkers at the 3rd Annual Azalea Half Marathon, 10K & 5K at the Gardens at Woodfield in Nixa, MO. Participants enjoyed a beautiful day with cool temps, a challenging course and pancakes! Bounce houses were available for the kids, plus a few vendors & great music. 2015 Azalea Half Marathon New Balance tech short sleeve shirt. Black in color. 2015 Azalea Half Marathon unisex sleeveless New Balance tech shirt. Black in color. 2015 Azalea Half Marathon Shirt. Short Sleeve New Balance tech shirt. Black in color. 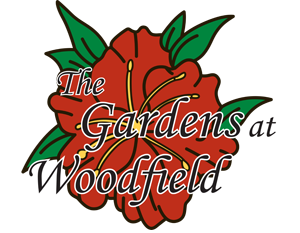 If you were unable to stay for the awards ceremony at the Azalea Run on Saturday, September, 12, 2015 they will be available for pick up on Tuesday, September 15, 2016 at Garden Adventures & Nursery, 1900 W. Mt. Vernon Street in Nixa. We will leave them there for approximately 2 weeks. If you are unable to pick up your medal during this time frame or you live out of state, please send an email to and arrangements can be made. If you're needing a hotel room for the Azalea Run, the Nixa Super 8 is the place to stay! The Super 8 is located at 418 N. Massey Blvd in Nixa, which is less than 2 miles from the Gardens at Woodfield (Race Start/Finish Location). They are the host hotel for the Azalea Run offering a discounted price of \$60 + tax. To get in on this great offer, please call and make reservations (417)724-0880 and let them know you'll be participating in the Azalea Run. Check-In time is 3PM and Check-Out is 11AM. 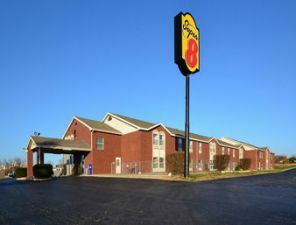 The Nixa Super 8 offers a continental breakfast from 6AM to 9AM. It's new and exciting this year! Every month we will be giving away very cool 2014 Azalea Run Swag. Here is how it works. We will give away an Azalea Run gift every month. 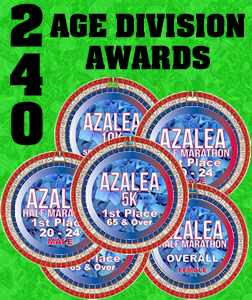 Everyone that register's for the 2014 Azalea run qualifies. You will be entered into the drawing and remain in the drawing's all the way up to the 2014 run. So the earlier you register the more of an opportunity you will have to win an Azalea Run gift. At the first of each month leading up to the run we will release a video of the drawing winner and the unveiling of the next month's gift. Each month will be a different Azalea Run swag gift. The first 2014 Azalea Run swag gift we will give away is this 22 oz. Stein. AND!!! To give you more of an opportunity to win an Azalea Run Gift and to show our appreciation for your support...we will give you an extra ticket into the drawing for everyone you refer to register for the Azalea Run. All that is needed is for the person you refer to list you as the referee when they sign up. Azalea Run unisex sleeveless tech shirt. Grey in color. 2015 Azalea 5K & 10K Shirt. Grey short sleeve tech shirt. 2015 Azalea 5K & 10K Shirt. Grey sleeveless tech shirt. If you're needing a hotel room for the Azalea Run, the Nixa Super 8 is the place to stay! The Super 8 is located at 418 N. Massey Blvd in Nixa, which is less than 2 miles from the Gardens at Woodfield (Race Start/Finish Location). They are the host hotel for the Azalea Run offering a discounted price of \$60 + tax (old section) \$65 + tax (new section). To get in on this great offer, please call and make reservations (417)725-0880 and let them know you'll be participating in the Azalea Run. If you're needing a hotel room for the Azalea Run, the Nixa Super 8 is the place to stay! The Super 8 is located at 418 N. Massey Blvd in Nixa, which is less than 2 miles from the Gardens at Woodfield (Race Start/Finish Location). They are the host hotel for the Azalea Run offering a discounted price of $52.00 + tax. To get in on this great offer, please call and make reservations (417)724-0880 and let them know you'll be participating in the Azalea Run. PRICE INCREASES FOR THE AZALEA RUN SUNDAY, JUNE 1ST!! Register now for the Half Marathon for ONLY $45!! Sapphire New Balance tech shirt, 5" Custom Half Marathon Finshers Medal, 1" Custom Lapel Pin, plus there's a TON of Age Division Awards!! There's going to be vendors, entertainment, food & beverages, plus much more!! It's an event you're not going to want to miss!! Join us Saturday, September 13, 2014 for the 2nd Annual Azalea Run in Nixa. Parlor 88 Lounge & Eatery is the 2016 Azalea Run Team Award Sponsor!! The winning team will enjoy a night of their choosing in a private room at Parlor 88 which will include dinner and a drink of your choice! The largest team award will be based on the total number of team participants from all 3 events. Last year's Largest Team Award went to Title Boxing Gym with over 40 team members. Who's it going to be this year? ?